The Zebra Sharbo X LT3 is a brass-body multipen with three interchangeable components. I chose the pen in Cobalt Blue, but you have a choice of other colors for the exterior (black, silver, champagne gold, and azure blue). The pen feels solid in the hand because of the brass construction. It isn't heavy, weighing 22.9 grams with the refills inserted. At only 9.3mm in diameter, it might be a bit thin for those with larger hands. 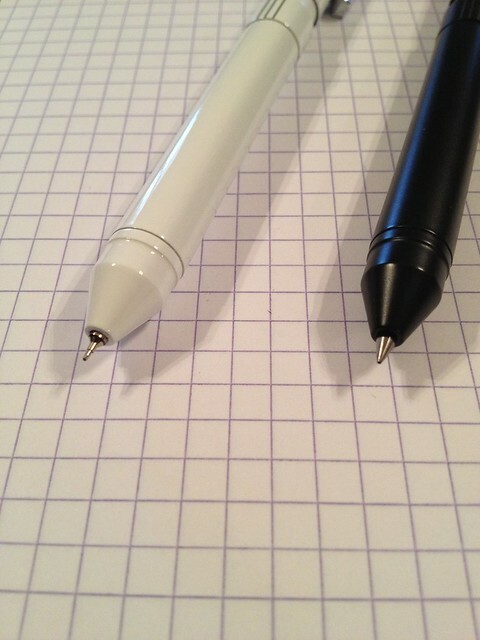 The pen allows for three components: a mechanical pencil (0.3mm, 0.5mm, or 0.7mm) and two pens or a pen and a stylus. The stylus is only for resistive touch screens, so it won't work with iPads, iPhones, or other capacitive touch screens. Pen refills come in a variety of colors and sizes. You can choose gel inks in 0.3mm, 0.4mm, and 0.5mm or ballpoint refills in 0.7mm and 1.0mm (these are the only sizes I could find for ballpoint refills on JetPens, but I did find a 0.5mm ballpoint refill on another site). Colors include Royal Blue, Carmine Red, Blue Black, Black, Blood Red, Blue, Magenta, Sepia, Mandarin Orange, Evergreen, and Emerald Green in the gel inks. In ballpoints you can also choose Fluorescent Pink or Green. Refills come in small cellophane packages, one refill per package. Gel refills cost $2.75 each, ballpoint refills are $2.65 each, and pencil refills are $5.00 each. If you want the stylus it is $5.00. One of the benefits of the Zebra Sharbo X system is you can mix sizes for the components in each pen. For instance, you can have a 0.5mm mechanical pencil, a 0.4mm pen, and a 0.3mm pen in different colors. The Zebra Sharbo X LT3 comes with a small eraser underneath a screw-on cap on the end of the pen. If you do lots of erasures, you may want to leave the cap off (but put it in a safe place because it is small and easy to lose). With such a small eraser, you'll either need to buy refills (pack of 3 for $1.65) or use a larger, separate eraser. The pen does not come with any pen components, so you'll need to order those along with the pen. Inserting the refills is fairly simple (which is good, since all the instructions are in Japanese). Just unscrew the barrel portion below the Sharbo X logo and push the refills in. It took me a while to figure out how to get the pencil refill in it takes a bit of force to push it onto its barrel. To select which pen/pencil you want to use, twist the barrel to one of the marks on the outside. When you want to advance the lead, push on the back of the pen with your thumb on the eraser cover. To retract the writing implements, twist the barrel so it is between the exterior marks. I never use a clip with my pens, but the clip on the Sharbo X is flexible and should work fine on a shirt pocket. I bought the Zebra Sharbo X LT3 for underlining and making marginal notes in textbooks. I'm not a big fan of highlighters, but I wanted to underline in different colors and make notes using a color code. I use the pencil if I want to erase my marks (for instance, in a library book). The pen works quite well for this purpose. Underlining and making brief marginal notes does not tax the hand. However, while writing this review, I found my hand cramping. This may be due to the pens small barrel size or the fact that I am using 0.3mm pen sizes that make me write smaller than usual. I ordinarily write with fountain pens, so I am accustomed to larger barrels and larger nibs. The Zebra Sharbo X LT3 is well made as it should be for $49.50. The brass construction is solid. Nothing about this pen body feels cheap. However, I am very disappointed in the quality of the gel ink refills. They run out or dry out quickly. I've had to discard one refill that refused to write at all. At $2.75 a pop, they aren't inexpensive you could buy a full-sized gel pen for that much. I haven't tried the ballpoint refills yet because they only come in larger sizes, but I may resort to them if the gel refills continue to drive me crazy. My first multipen was the Pilot Hi-Tec C Coleto. That pen is plastic and much cheaper. But the refills worked like a dream and the pen was a bit wider, lighter, and easier to hold. I may wind up going back to that pen in the future even though I didn't like the Coleto's plastic construction. The Zebra Sharbo X LT3 is available at JetPens for $49.50. Pen/pencil components are not included with the pen. Posted on March 20, 2015 by Susan Pigott and filed under Pen Reviews, Multi Pen, Sharbo X, Zebra. I Get Mail: Does the Pilot Hi-Tec-C Slims refill fit in the Zebra Sharbo X? I am always happy to answer reader mail and over the years I have answered a lot. I'm not exactly the fastest responder, but I do my best to answer them all. On occasion, I get repeats of the same question so I thought it would be good to answer some of those publicly to help out other readers who may be wondering the same thing. 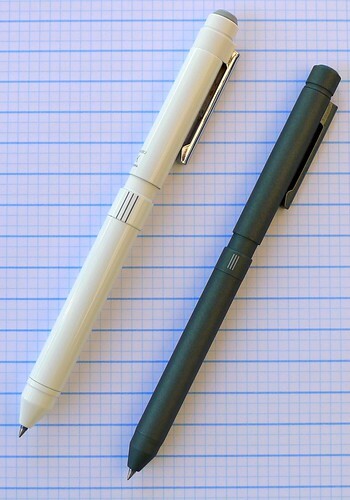 So, here is the first one, from Mike: Does the Pilot Hi-Tec-C Slims refill fit in the Zebra Sharbo X? Both of these pens use what is called a D1 size refill, so yes, the Slims refill fits fine in the Sharbo X. Most D1 refills are interchangeable between brands, although the small tolerances might make the fit tighter or looser depending on the pen. For example, the Slims refill fits in the Sharbo X like a glove, but I had to force the Sharbo X refill into the Slims barrel. In the end it fit and worked fine, but some force was required to seat it properly. Mike also wondered if the Pilot Hi-Tec-C Slim Knock or the Pilot Hi-Tec-C Coleto refills would work, and the answer in no. Those refills are much to long to fit in the Sharbo X.
I hope this helps you out Mike, and hopefully this helps other readers who had the same question. Posted on December 26, 2012 by Brad Dowdy and filed under Pilot, Sharbo X, Mailbag, Hi-Tec-C. It is a well known fact that I am a big fan of the Zebra Sharbo X multi pen. I first tried the ST3 model over two years ago when I bought it used from a Pen Addict reader. I was impressed by the build quality, functionality, and customization options available. It is a great pen, and has enjoyed high placement in many of my Top 5 Pens lists over the years. The ST3 is just one of the many barrel styles of the Sharbo X, and I am happy to now get the chance to review the LT3 model. The primary difference between the ST3 and the LT3 is the diameter of the barrel. The LT3 is more of a normal width barrel at 9.3mm in diameter, while the ST3 is a wider body at 11.1mm. The barrel finish on the LT3 is also a matte style and comes various colors like Orange Flame and Azure Blue. The ST3 is smoother and comes in basic black, white, and silver. The functionality between the two is the same, with both containing one slot for a pencil cartridge, and two slots for gel or ballpoint ink cartridges. When comparing the two side by side, I can tell a difference between the pens in how the pencil and ink cartridges are moved into the writing position. The twist mechanism works the same on each - you twist the top half of the barrel from station to station to expose the tip - but on the LT3 there is more or a “grab” on the inside of the barrel when moving from slot I to slot II. Opening up the pen and looking at the issue, I think the gasket where the pencil cartridge connects is pushing against the pen cartridge in slot II causing it not to eject as smoothly. This doesn’t happen in the ST3 model, and I’m guessing the wider barrel is the difference. The cartridges have more room to move. It isn’t a deal breaker for me, but after using the ST3 for so long it is noticeable. The one thing that doesn’t change between the pens is the performance of the ink cartridges. If you like how Zebra gel ink pens like the Sarasa Clip write, then you will love the Sharbo X refills. The lines are clean and sharp, and come in a ton of cool colors. The downside is the refills don’t last very long, and they are expensive to replace, so be aware of that commitment if you are going to take the plunge. The Zebra Sharbo X is not a pen for everybody. Do you research, check out all the body styles, and decide if the barrel cost plus future cost of refills are for you. I love my Sharbos, but then again, I am a Pen Addict. 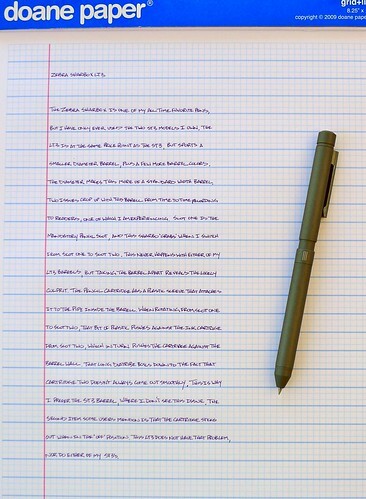 Posted on October 24, 2011 by Brad Dowdy and filed under Pen Reviews, Sharbo X, Zebra.